Loved this beer. Partner recommended it who was in Australia many years ago. Never heard of it before or seen it in Scotland, lovely beer though. Only downside is it disappears too fast. 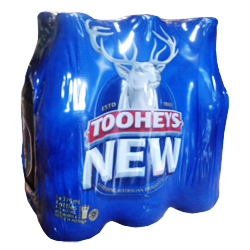 Drank so much Tooheys in NSW. I love the old too! For some reason, I never get a hangover with this stuff, drank it all the time when I was in OZ, over 3 visits, so I thought, well, may as well get some for the fridge here too!